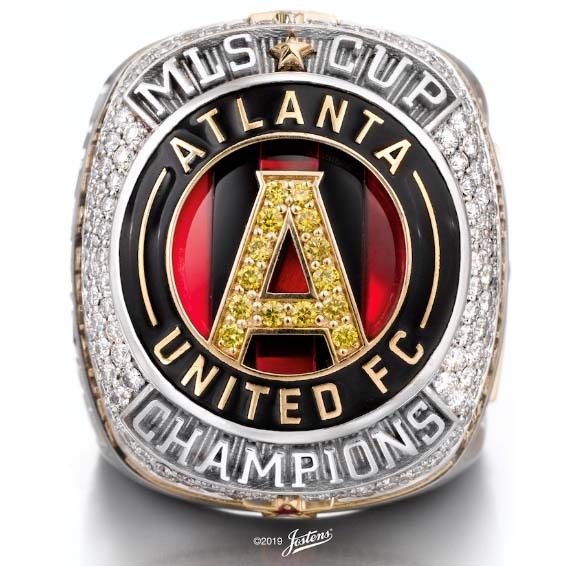 Atlanta United players received their colorful, gem-encrusted 2018 MLS Cup Championship rings in a private ceremony last week. The rings use white diamonds, yellow diamonds, custom cuts of garnet and onyx, and a single ruby to tell the story of a remarkable franchise that shot to the top of the soccer world in just its second season. The diamonds weigh a total of 2.03 carats. Crafted in 10-karat white and yellow gold, the rings are adorned with 101 white diamonds that create a cascading waterfall effect on the ring top. An additional 14 color-enhanced yellow diamonds form the “A,” which sits atop the iconic five stripes, which mimics the distinctive red and black uniform of the team. Ring manufacturer Jostens rendered the five stripes in alternating custom-cut slices of garnet and black onyx. The stripes represent the five pillars of the team: unity, determination, community, excellence and innovation. The red color symbolizes victory and the black color symbolizes strength and power. Yellow gold “train tracks” wrap around the top of the ring edges as an ode to Atlanta’s railroad history. The tracks are punctuated with a single white diamond and a single ruby. The two gemstones represent the number of years the franchise has been in the MLS. 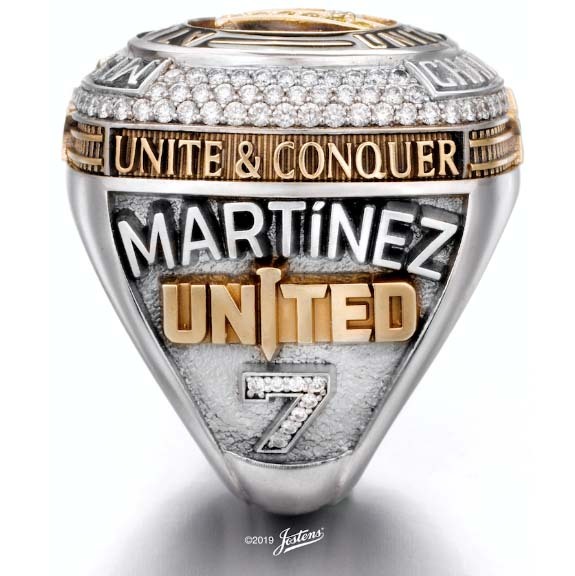 Completing the ring top are the words “MLS CUP CHAMPIONS” in raised white gold lettering, accented with a gold star. 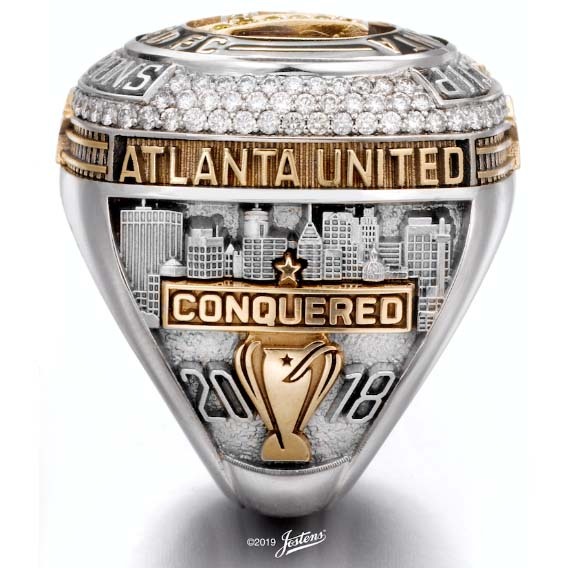 The right side of the ring features the club name set in raised yellow gold lettering above the Atlanta skyline, which is rendered in white gold. The coveted MLS Cup, in contrasting yellow gold, sits in the center of the city skyline, with the word “CONQUERED” boldly set upon the trophy. The championship year date of 2018 completes the right side of the ring. The left side of the ring displays the club’s rallying cry “UNITE & CONQUER” in yellow gold, set above the recipient’s name in white gold. In contrasting yellow gold, the “UNITED” mark pays tribute to Atlanta’s unwavering perseverance. The “I” in “UNITED” is replaced with a golden spike, a nod to the city’s railroad history. Prior to each match, players and supporters get to sign a giant-sized golden railroad spike, which is then ceremoniously marched into the stadium and hammered into a platform by a local VIP. After each game, the Man of the Match gets to hammer the spike, as well. Completing the left side of the ring is the player’s number set with diamonds.